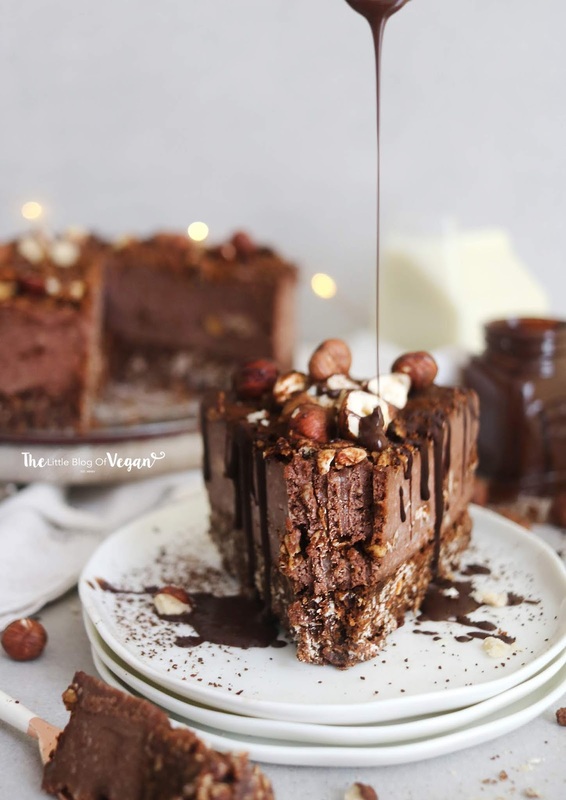 A moorish and extremely delicious praline cheesecake, with a crunchy hazelnut chocolate base, a delicious praline chocolate cheesecake layer, topped with dairy-free dark chocolate drizzle and whole hazelnuts. No-bake cheesecake never tasted so good!!! This recipe is in collaboration with Alpro + Kelloggs. I used the new Alpro Oat Milk in the cheesecake layer, which gives a subtle oaty flavour. It really compliments the cacao! I also used the new Kellogs 'Cocoa + Hazelnut' granola which is truly scrumptious!!! This has become my 'go-to' breakfast granola. It tastes just like a Ferrero Rocher, but healthier, obviously- haha! The Oat milk is unsweetened, and the Kelloggs granola contains no added sugar which is fab! both are 100% vegan!!!! I am so happy I decided to use it as a base for this cheesecake, it adds flavour, texture and crunch- Y U M! This cheesecake is quick & easy to make, and tastes incredible! It's a simple, yet decadent dessert for any occasion. 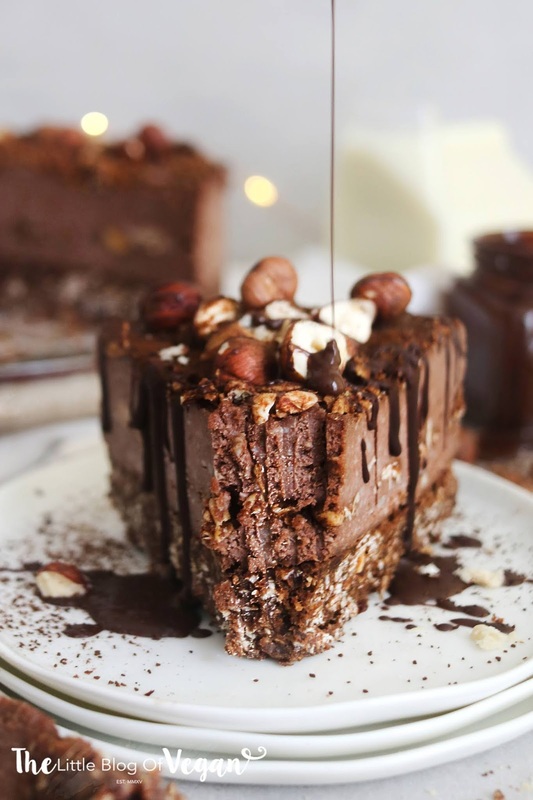 If you love chocolate and cheesecake.....you need to give this a go! Step 1- Line an 8" cake tin with greaseproof paper. I prefer to use a push-up cake tin. Step 2- In a food processor/blender, add in the Kellogs granola or hazelnuts, de-stoned/pitted dates, melted chocolate, melted coconut oil and cacao powder. I sprinkled over some chopped hazelnuts for extra texture (optional). Step 1- Drain the water from the soaked cashew nuts, and place them into a food processor/blender, along with the hazelnut butter, melted coconut oil, dairy-free milk, maple syrup, cacao powder and water. Step 2- Pour the creamy praline layer onto the base, level then pop back into the freezer to set. 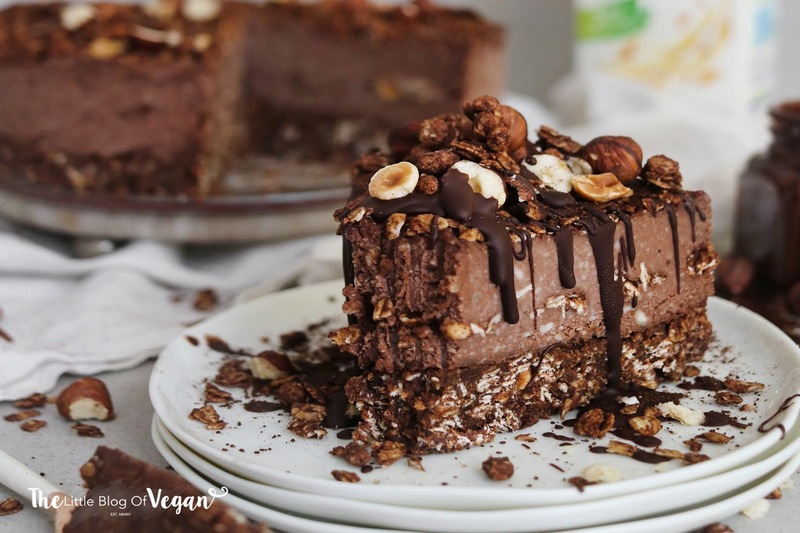 I served my cheesecake with a drizzle of melted dairy-free dark chocolate and some whole nuts. Shop the whole 'Alpro' range here. This is a paid collaboration with Alpro. 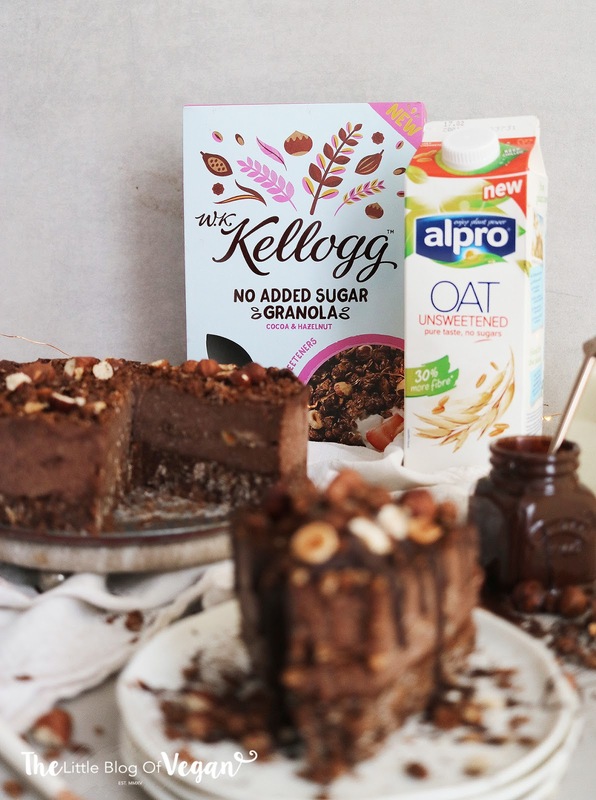 A huge thank you to Alpro + Kelloggs for collabing on this recipe with me! 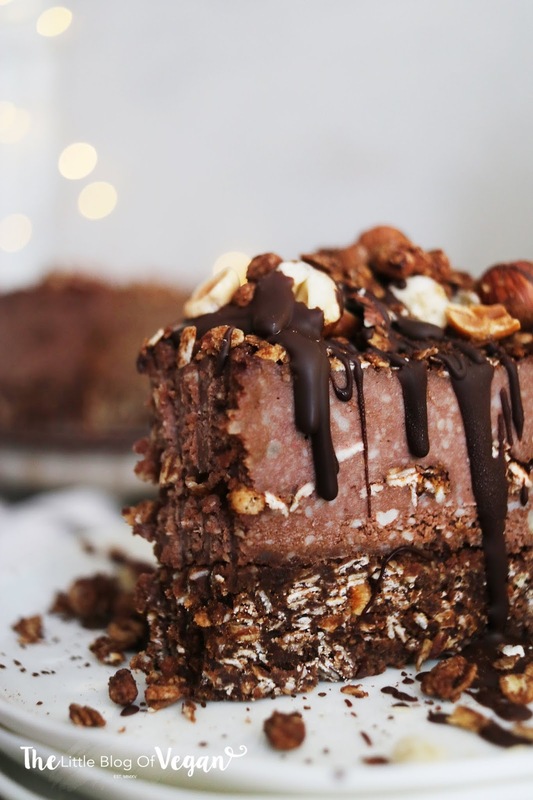 This cake looks so decadent and delicious! Super chocolatey!